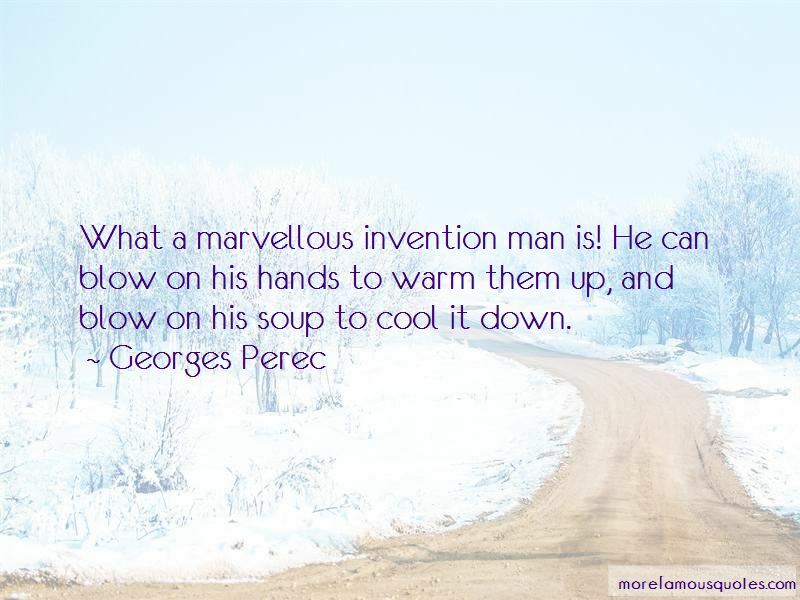 Enjoy the top 24 famous quotes, sayings and quotations by Georges Perec. As the hours, the days, the weeks, the seasons slip by, you detach yourself from everything. You discover, with something that sometimes almost resembles exhilaration, that you are free. That nothing is weighing you down, nothing pleases or displeases you. You find, in this life exempt from wear and tear and with no thrill in it other than these suspended moments, in almost perfect happiness, fascinating, occasionally swollen by new emotions. You are living in a blessed parenthesis, in a vacuum full of promise, and from which you expect nothing. You are invisible, limpid, transparent. You no longer exist. Across the passing hours, the succession of days, the procession of the seasons, the flow of time, you survive without joy and without sadness. Without a future and without a past. Just like that: simply, self evidently, like a drop of water forming on a drinking tap on a landing. What we need to question is bricks, concrete, glass, our table manners, our utensils, our tools, the way we spend our time, our rhythms. To question that which seems to have ceased forever to astonish us. We live, true, we breathe, true; we walk, we go downstairs, we sit at a table in order to eat, we lie down on a bed on order to sleep. How? Where? When? Why? Describe your street. Describe another. Compare. “People who choose to earn money first, people who put off their real plans until later, until they are rich, are not necessarily wrong. People who want only to live, and who reckon living is absolute freedom, the exclusive pursuit of happiness, the sole satisfaction of their desires and instincts, the immediate enjoyment of the boundless riches of the world [ ... ] such people will always be unhappy. It is true [ ... ] that there are people for whom this kind of dilemma does not arise, or hardly arises, either because they are too poor and have no requirements beyond a slightly better diet, slightly better housing, slightly less work, or because they are too rich, from the start, to understand the import or even the meaning of such a distinction. 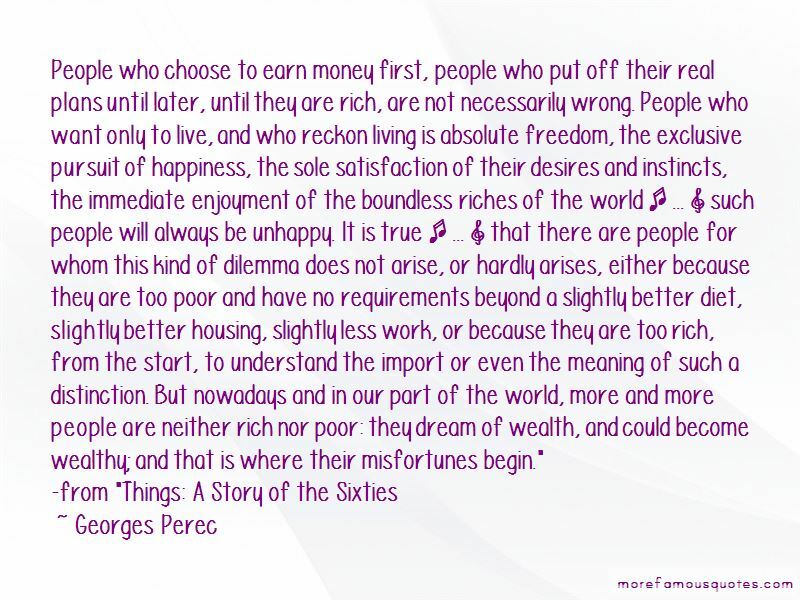 But nowadays and in our part of the world, more and more people are neither rich nor poor: they dream of wealth, and could become wealthy; and that is where their misfortunes begin." “You will never stop seeing yourself. You can do nothing, you cannot escape yourself, you cannot escape your own gaze, you never will be able to: even if you were to fall into a sleep so deep that no shock, no shout, no burning pain could rouse you, there would still be this eye, your eye, that will never close, that will never sleep. You see yourself, you see yourself seeing yourself, you watch yourself watching yourself. Even if you were to wake up, your vision would remain the same, immutable. Even if you managed to grow thousands, billions of extra eyelids, there would still be this eye, behind, which would see you. You are not asleep but sleep will never come again. You are not awake and you will never wake up. You are not dead and even death could never set you free." Like the librarians of Babel in Borges's story, who are looking for the book that will provide them with the key to all the others, we oscillate between the illusion of perfection and the vertigo of the unattainable. In the name of completeness, we would like to believe that a unique order exists that would enable us to accede in knowledge all in one go; in the name of the unattainable, we would like to think that order and disorder are in fact the same word, denoting pure chance. It's possible also that both are decoys, illusions intended to disguise the erosion of both books and systems. It is no bad thing in any case that between the two our bookshelves should serve from time to time as joggers of the memory, as cat-rests and as lumber-rooms. Above all, they had the cinema. And this was probably the only area where they had learned everything from their own sensibilities. “They would have liked to be rich. They believed they would have been up to it. They would have known how to dress, how to look and how to smile like rich people. They would have had the requisite tact and discretion. They would have forgotten they were rich, would have grasped how not to flaunt their wealth. They wouldn't have taken pride in it. They would have drunk it into themselves. Their pleasures would have been intense. They would have liked to wander, to dawdle, to choose, to savour. They would have liked to live. Their lives would have been an art of living. What they liked in things they called luxury was only the money behind them; they loved wealth before they loved life. 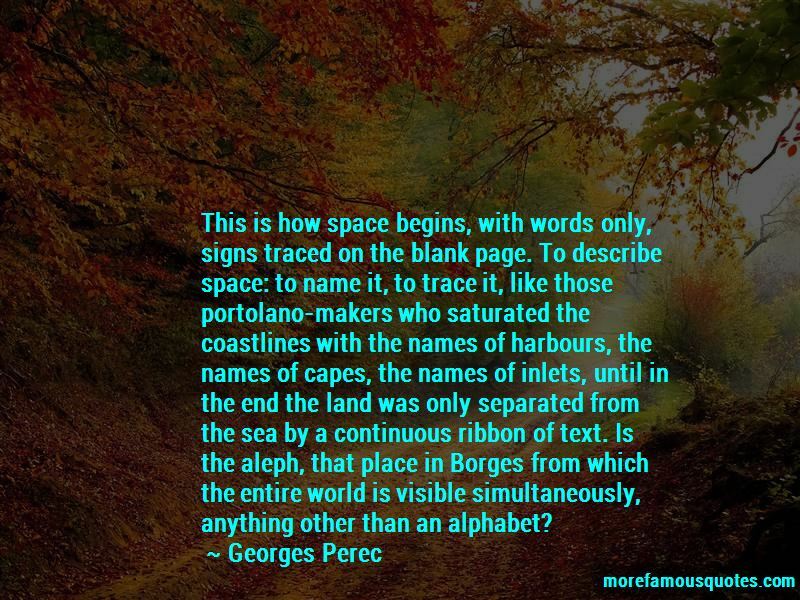 Want to see more pictures of Georges Perec quotes? 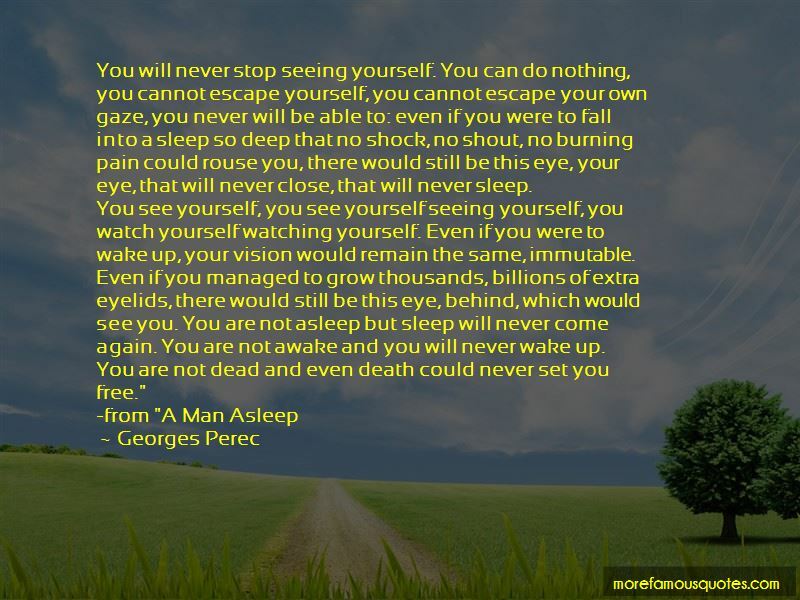 Click on image of Georges Perec quotes to view full size.